What’s for dinner tonight? It’s the question parents so often dread. What is for dinner, indeed? In households across the country, so many of us experience this frustration nightly: How do you get healthy food on the table that everyone will eat? Imagine, however, flipping that scenario around: What if the parents were asking the kids? This seemingly far-fetched idea has inspired my resolution for the new year. I want to involve my girls, aged 7 and almost 10, more significantly in the kitchen. Their dad and I long have been asking them to set the table, clear the dishes, scrape the plates and load the dishwasher, which they do while gritting their teeth. I’ve already taught them to make a few favourite foods. This year, however, I want my girls to really cook, to make their grandma’s coconut chicken curry or a soup, without the help of powders, jars or cans. At a time when fewer adults are cooking from scratch – according to an Industry Canada report, in a given day only a quarter of Canadians eat a homemade meal from scratch – research keeps telling us that cooking is a path to good health, particularly when it comes to children. So it’s a good time to get all kids – think age 10 and up – into the kitchen to share the job of feeding the family. According to a 2012 study out of the University of Alberta, children who help cook meals have a greater preference for vegetables – 10-per-cent higher than those who don’t help out. The connection between health and cooking is so persuasive that, last September, schools in the United Kingdom implemented a new national curriculum for cookery as part of the country’s effort to improve children’s diets. In the spirit of New Year’s resolutions, here’s a five-week plan to enjoy one landmark night in February when your kid will make you dinner. 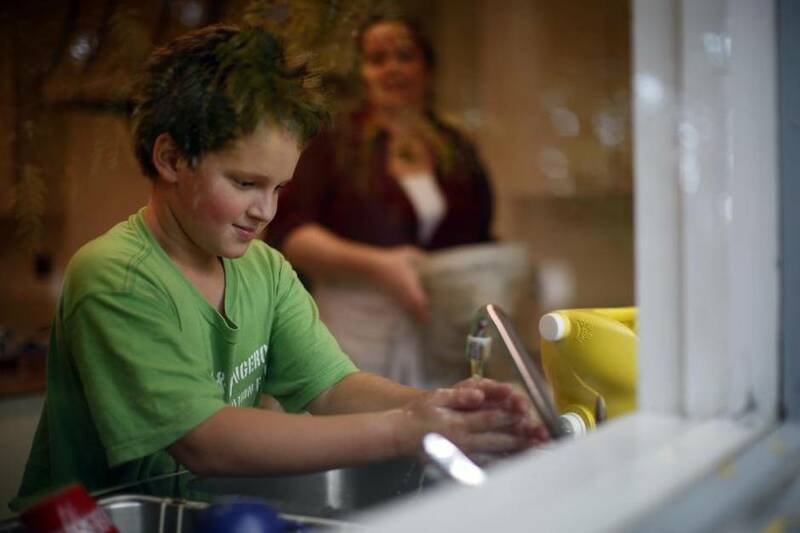 Malcolm Colwell,10, washes his hands before making bread. If you want to proudly eat your kids’ home-cooked dinners, they are going to have to use sharp knives and heat. Not only does this mean you have to teach them how to handle a blade, but you have to keep your parental anxieties in check. Remember, it’s important for kids to take risks, and kids learn through doing. The long-term goal is independence for your child. In fact, Martin Aller-Stead, a teacher who became a chef and runs a culinary arts course at Monarch Park Collegiate in Toronto, has found that often it is parents who stand in the way of progress in the kitchen. “Most [kids] are kept in a state of dependency by being told you can’t do this, you can’t do that,” he says. The kitchen is a great place to let go. “It gives them confidence and it also gives them independence,” he says. Start with basic knife skills. Kids need to learn how to hold a knife. In Britain, kids are taught to keep their fingers safe by using the bridge hold when cutting things like tomatoes, apples and potatoes, and the claw grip for many fruits and vegetables. Move to the stove. Kids need to be taught such basics as: The handle of a boiling pot of water can be burning hot, and the steam can scald your skin. Always wear oven mitts when you take something out of the oven. Don’t lean over the stove with your long hair hanging toward the heat. Kids can practise safe-cooking skills by boiling pasta, making rice or taking a baked dish from the oven. It’s time for some show and tell: They need to know how to use a measuring cup and a grater, and even how to stir a pot with a wooden spoon without burning themselves with the steam. Ask your kids what they want to cook. Find a recipe and show them how to read it. Then plan to make it together on a day when no one is rushed and you can be present. At the Edible School Yard Project, the first meal Grade 6 students make are greens and grains. They learn to steam millet (you could choose rice or quinoa instead) and stir-fry greens. 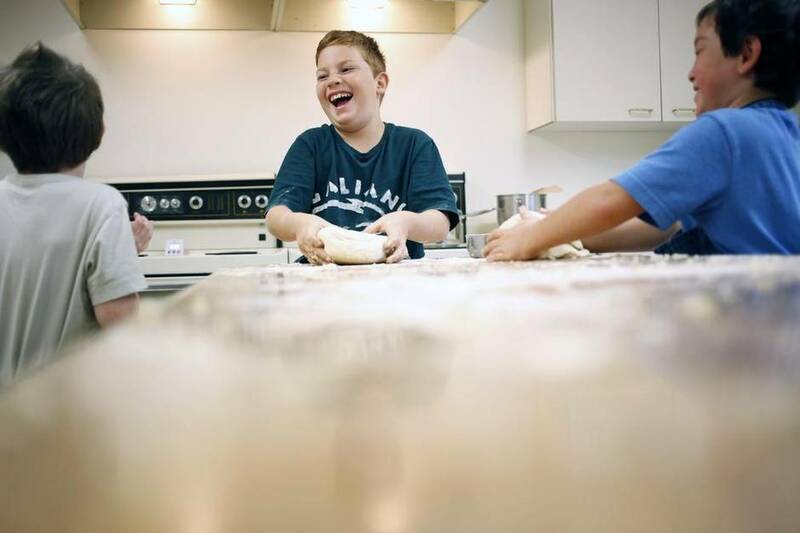 Caleb Wilson, 10, shares a laugh with classmates as he kneads dough. Now that you’ve cooked a meal together, it’s time to start letting go even more. Aller-Stead suggests starting with snacks. 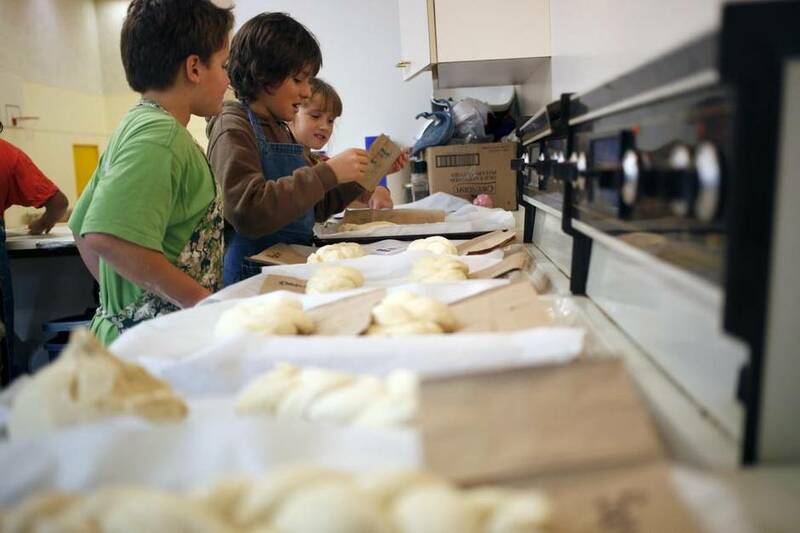 As part of the Galiano Community Food Program on British Columbia’s Galiano Island, program co-ordinator Alison Colwell teaches school-aged children to cook by starting with baking bread from scratch. Ask your children to choose what after-school snack they’d like to make, and find a recipe. Plan ahead and make sure you have all the ingredients. Reduce your hovering as they become more competent. Aller-Stead suggests homemade hummus and carrot sticks. Or plain yogurt with cooked fruit coulis. My girls love cream cheese and I’ve showed them how to hang yogurt to make a soft cheese in which you can blend ingredients such as olives, roasted red pepper or chives. Make sure they clean up. Snack clean-up definitely can be tackled alone. 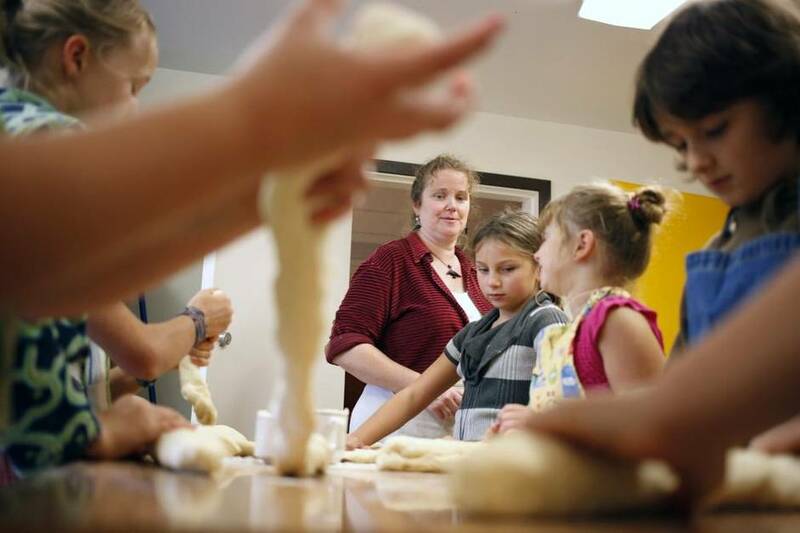 Program co-ordinator Alison Colwell looks on as students braid their dough. In the Edible School Yard kitchen, one of the first meals students learn to make is an autumn harvest soup. “We want them to understand that we’re not going into the kitchen to bake cake,” says Cornforth. Soup is a wonderful dish for a beginner because it is so flexible and forgiving and you can use whatever ingredients you have on hand. 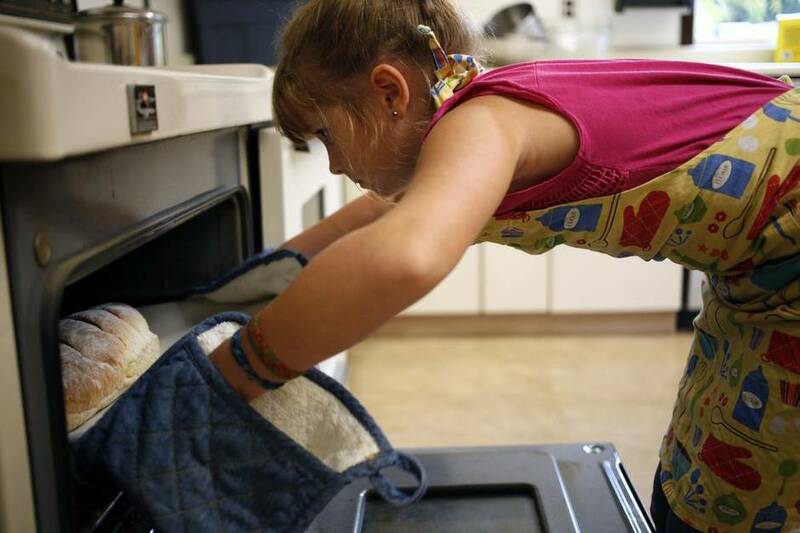 “Kids can see a recipe isn’t a strict mandate, but rather a guide,” she says. For their harvest soup, the students gather vegetables from the garden, and learn about eating with the seasons. Also, they learn about minimizing food waste by simmering carrot peels and garlic and onion skins to make stock. Along with the soup for dinner, you could serve a salad (another easy dish for a child to make – my youngest can make a dressing and loves to spin the greens). Fresh bread and butter would go nicely, too. Students label their bread before baking. Your children have been working on knife skills. They’ve learned how to use the stove, make a snack and prepare soup from scratch. The next step is to learn to make the sauces to build a meal around. Aller-Stead recommends beginning with a tomato sauce. At the Edible School Yard, students learn to make salsa verde (great for a snack) and even a from-scatch curry gravy, fresh toasted spices and all. Aller-Stead says kids can easily learn to roast a basic cut of meat or make stew. Show your children how to make a sauce of their choice. In addition to tomato sauce, they can learn to prepare a real cheese sauce by browning butter with flour to make a roux, to which they add cheese and milk – the base of homemade mac and cheese. Choose a recipe from your own family’s food culture and cook it together, making sure you show them cuisine-specific techniques. Frittata is easy, delicious and flexible, depending on what you have in the fridge. Pasta with a homemade sauce of your choice. Dal and rice. We’ll work toward kuku paka, a coconut chicken curry that reflects the cuisine of East Africa where my husband was born. Danny Clark, 10, puts a tray of bread into the oven. WEEK FIVE: WHAT’S FOR DINNER? Onions can seem intimidating for the uninitiated. To start, slice off the pointed end of the onion and stand the onion on its flat end. Making a bridge with your fingers and thumb, cut the onion in half. Peel off the skin. To slice, lay one half of the onion on its flat side. Make your fingers into a claw and draw the knife across the onion – using your fingers as a guide. Sarah Elton is the author of the book for young people, Starting from Scratch: What You Should Know About Food and Cooking.